NXT UK followed up on TakeOver with a set of television tapings at the Empress Ballroom in Blackpool, England on Sunday. - There wasn’t much storyline development on the tapings and no backstage vignettes or promos were shown. There were some very good matches, and WALTER was over huge as one of the biggest babyfaces on the roster. He is being positioned as a babyface even though he’s stoic and no sells tons. Menzies was a heel, billed from Yorkshire, wore a flat cap, and brandished a wooden baton. He was super green and won with a powerslam. - WWE United Kingdom Champion Pete Dunne started the tapings with an in-ring promo. Gallus came out to confront him, with Joe Coffey claiming Dunne’s win at TakeOver was a fluke. WALTER came out to a huge reaction and all the fans sang his theme music. After a brief scuffle, WALTER cleared the ring of Mark Coffey while Dunne disposed of Wolfgang. Samuels won with an Attitude Adjustment. They had a decent match. Austin got a big pop, as she’s a long-time wrestler based in the northwest and most in attendance knew of her. Jordan hit a Swanton Bomb on Huxley for the win. This was a great match until the finish. Devlin hit a Spanish fly on Banks off the apron to the floor, and again in the ring, which Banks kicked out of. After both tumbled to the outside, they were counted out. They then began brawling into the crowd before officials split them up. Mastiff won it with a cannonball in the corner. - NXT UK Tag Team Champions Zack Gibson & James Drake came out for an in-ring promo. Gibson called their team the "Grizzled Young Veterans" on NXT UK TV for the first time. Sid Scala came out and said he was searching the world for the best tag team competition for them. 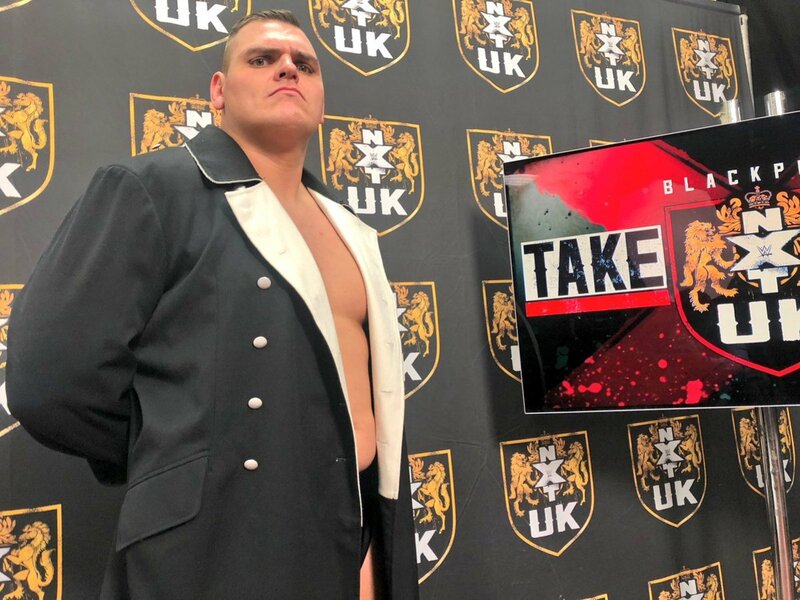 Scala mentioned that NXT UK would soon be taping TV in Phoenix, Arizona (at Royal Rumble Axxess in two weeks time) and that Gibson & Drake would soon face Oney Lorcan & Danny Burch in a match billed as "NXT vs. NXT UK." WALTER destroyed Starz in a perfect squash match. He gave Starz a slam on the apron, tons of chops, and used a powerbomb finisher. There were huge fan reactions to his squash debut win. Very good match between two great tag teams. It went about 12 minutes. Aichner & Barthel are fantastic as a pairing and worked so well together on various double-team moves. Ligero scored the win with a jumping DDT off the second rope. That came after Andrews had used a top rope Shooting Star Press, only to land on Ligero’s raised knees. A very good babyface vs. babyface, athletic high spots match. They shook hands afterwards. This was a battle of two 19-year-old babyfaces. Both are really talented and have big futures, especially Brookside. After the match, Rhea Ripley ran in and destroyed both, including putting Brookside in a swinging Indian Deathlock. NXT Women's Champion Toni Storm ran in for the save, but she accidentally headbutted Brookside after Ripley threw Brookside into her path. Ripley then gave Storm a pumphandle slam and left her laying. Coffey won with a suplex. Decent match. Super stiff match. They exchanged stiff as hell punches and chops, but WALTER largely no sold everything. WALTER won with a powerbomb. The crowd was very lively and reacted well throughout the tapings, although they were noticeably tired for the final hour after two straight days at the Empress Ballroom.